As you will see in the video the flower petal details and the leaves were done with acrylic paint. The these are done with watered down acrylic paint and the petals were done with straight out of the bottle acrylic paint. This mani was so easy and hard to name! Ha, I've realized I have filmed many floral nail art looks so I've been struggling with names. The more I thought about this one tho the more I realized how loose it was meaning done with no real precision. They literally start off as blobs and I was using the polish brush, nothing fancy. Then when we did the detailing it was all imperfect lines to make it work so it seemed fitting! Here is the tutorial so you guys can do it too! Its simple, and kinda fun, just imagine all of the colors you could do this with! You could totally change it up and make it seasonal of even use multiple polishes to get multiple flower color options! If you give them a go tag me so I can see! Be sure to check out all of the amazing Manis below! Great tutorial - the flowers look so complex but your tutorial shows just how easy it can be! Your flowers are so pretty and you make it look so easy!!! I really need to try this!!! Your color combinations are so perfect as is your talent. I watched your video on this technique and you really make it look easy! Thanks for the tutorial on how to create this look! This one may be my favorite of your recent florals! Another stunning floral! 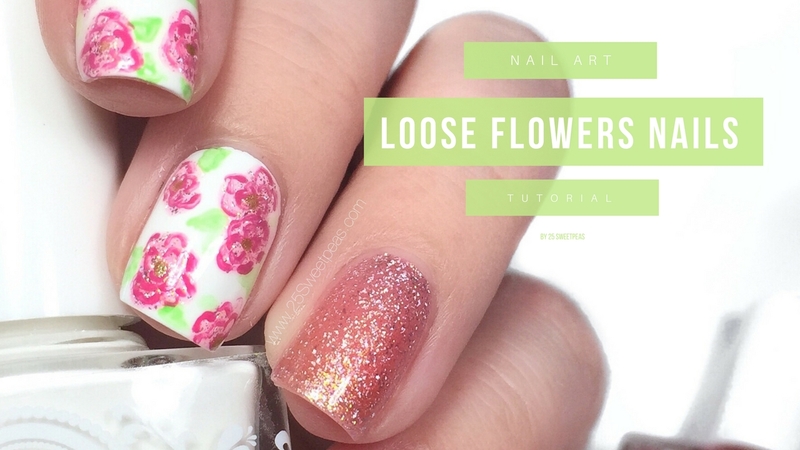 I love how you layered the glitter under the flowers. I love how you floral! This is beautiful. Thanks for the tutorial! It was easy to follow. I love the result of this. Definitely going to follow the tutorial and try it! I need to try this! The tutorial looks super easy. Your little flowers are so pretty.